Powers/Abilities: While not superhuman, Blackshirt is extremely strong and agile, and is able to climb surfaces most people would consider sheer and unattainable. History: Best-selling crime author Richard Verrell is secretly the gentleman crook Blackshirt. In his secret identity the police and authorities often call on his aid when dealing with crimes, due to his extensive knowledge of the topic. While originally a crook, his good nature and willingness to help those in need eventually led him to become a full fledged crime-fighter. Comments: Thanks to Stephen Montgomery for providing me with the initial information regarding this character, and to Terry Hooper for providing additional information on his literary background. 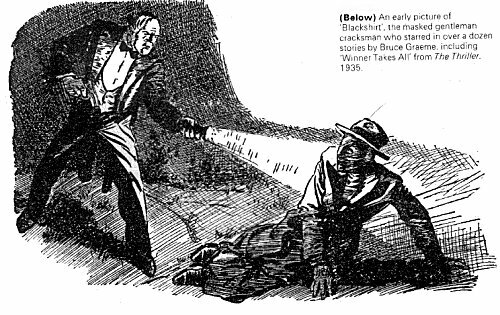 Blackshirt was created by Graham Montague Jeffries, (1900-1982), writing under the pseudonym of Bruce Graeme, starting with short stories that were collected in the book Blackshirt (1925). 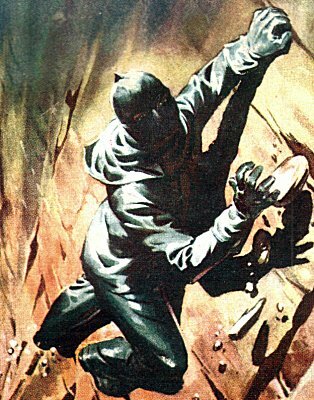 The adventures of the gentleman crook was also published in The Thriller magazine (probably prior to the collections, although I don't have confirmation of this). Graham Jeffries continued to write Blackshirt stories until at least 1940, with the books including The Return of Blackshirt (1927 ), Blackshirt Again (1929), Alias Blackshirt (1932), Blackshirt the Audacious (1935), Blackshirt the Adventurer (1936) , Blackshirt Takes a Hand (1937), Blackshirt Counter-Spy (1938), Blackshirt Interferes (1939), Blackshirt Strikes Back (1940). He also wrote books about Blackshirt's son, who apparently went under the alias of Lord Blackshirt - Son of Blackshirt (1941), Lord Blackshirt: The Son of Blackshirt Carries On (1942), and Calling Lord Blackshirt (1943). Blackshirt also made it into the comics, with stories appearing in strip form in Super Detective Library in the 1950's. As well as the son of Blackshirt, we were also introduced to his ancestor in David Graeme's Monsieur Blackshirt (1931). 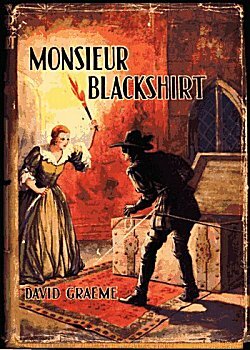 In the author's introduction he stated that he is the cousin of Bruce Graeme who wrote a popular detective series about a modern character named Blackshirt; in reality David Graeme was but another of Graham Jeffries pen-names.Set in 16th century France, Monsieur Blackshirt was "A gallant scallawag who is quick with his tongue & his sword & as quick to bandy words with a pretty wench." It is said that in his veins "flows the blood of the great de Rohan and a tawny gypsy girl." The other books in this series include The Vengeance of Monsieur Blackshirt (1934), The Sword of Monsieur Blackshirt (1936) and The Inn of Thirteen Swords (1938). Moonstone Publishing have recently produced some new Blackshirt short stories in some of their crime anthologies. Thanks to Mrs G. Hughes for corrections to the above.